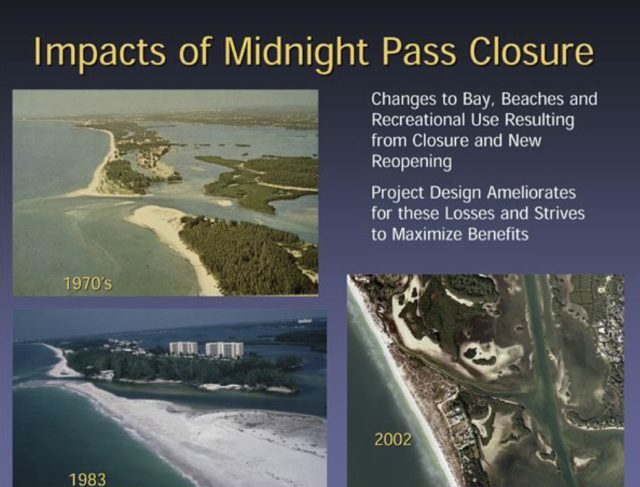 With the looming potential that Big Sarasota Pass will be dredged to renourish South Lido Key Beach, a past director of the Siesta Key Association (SKA) has pointed to the history of Siesta Key’s Midnight Pass as a cautionary tale. In December 1983, two property owners on the southern part of the Siesta Key — Pasco Carter and internationally acclaimed artist Syd Solomon — were alarmed that their homes were precariously close to tumbling into Midnight Pass. Their only hope, they decided, was to relocate the waterway. On Oct. 4, 1983, they won permission from the Sarasota County Commission to do that. 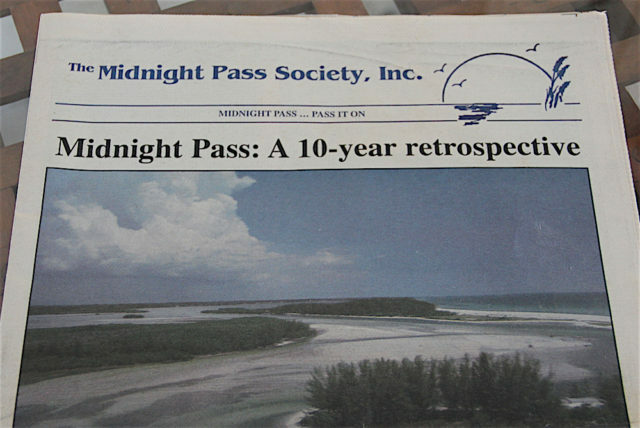 Then in December 1983, they brought in bulldozers and closed the channel, according to a timeline provided by the nonprofit Midnight Pass Society. 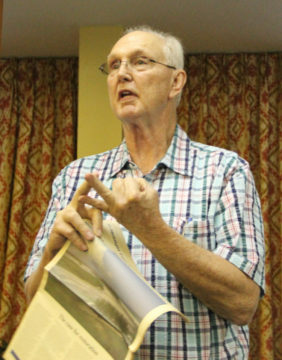 A former SKA director who served for many years with the organization — and a longtime member of the Midnight Pass Society— Waechter addressed about 80 people during the Jan. 12 SKA meeting. Scouring of the channel in Venice has been another result of the Midnight Pass action, Waechter pointed out, with between 80% and 90% of Snake Island having disappeared. 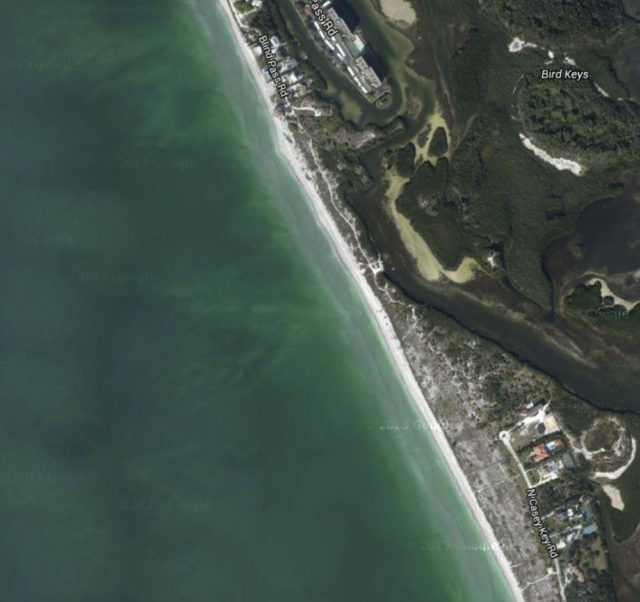 The northern end of Siesta Key has seen scouring as well, Waechter noted. 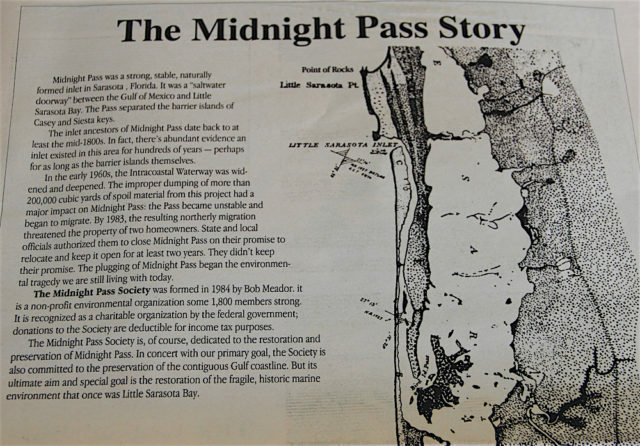 “Most people don’t know that Midnight Pass had a greater volume of water flow through it” than either of the passes on each end of the key, he added, referring to Roberts Bay and Blackburn Bay. 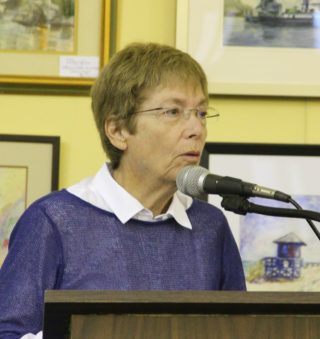 In 1994, Waechter explained, “the county came around to our way of thinking,” in large part because of the efforts of Nora Patterson, who served on the County Commission for four terms before having to step down in 2014 as a result of term limits. Prior to that, she was a Sarasota city commissioner for eight years. Patterson also lives on Siesta Key. The state ultimately refused to grant the county permission to reopen the pass, he added. The USACE manager who introduced the Lido proposal in September 2013 said the project would cover a 50-year period, but in its Dec. 22, 2016 Notice of Intent for the project, FDEP staff wrote that the permit it would issue would be good for only 15 years. The USACE has predicted that more sand will be removed from Big Pass every five years to continue to bolster South Lido Beach. “We called him ‘Mr. Beach’ at that time,” Waechter added. Leatherman is known as “Dr. Beach” for the Top 10 U.S. beaches list he issues each Memorial Day weekend. In 2011, he named Siesta Public Beach No. 1; the beach earned the No. 2 spot in 2016, after Leatherman decided to allow shorelines that he previously had honored to be reconsidered again. Then SKA Vice President Catherine Luckner introduced former Commissioner Nora Patterson, who pointed out that she has lived on Siesta Key since 1970. “I think [Waechter] said it really, really well,” Patterson began. Very quickly, however, someone — probably from the county — showed up with a bulldozer, she said, and closed the pass again. “I actually have pictures … of individual people really outraged, but also realizing the humor of what they were doing,” she told the audience. I love the honest, researched information that Rachel Brown Hackney provides. Its one of the few publications I can trust for accuracy.